snowdeal.org > ex machina: the eric update - day 1006: odin's new bird feeder! the eric update - day 1006: odin's new bird feeder! 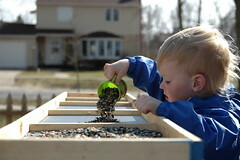 odin and i spent the afternoon making his new platform bird feeder which is visible from the kitchen table. we're all very excited at the prospect of it attracting all the birds that we already see around the neighborhood and there are certainly an abundance of species in the area. i don't think there's a better way to start the day than to have a little breakfast while trying to name all the birds you see and odin thinks that would be mighty fun too. it's a monstrous feeder at 6 feet ( 1.82m ) long and 1 foot ( 0.30m ) wide. the bottom is cut from a large patch of window screen and seems to do a great job of holding in the seed mixture while allowing moisture to pass through. you can't see the most difficult part of the construction process which involved digging two 3 foot ( 0.9m ) holes for the 8 foot ( 2.4m ) cedar posts that the platform rests on. i made the design up as i went along, but i think it turned out alright. sometime soon i'll probably put a cedar shingle roof but we couldn't wait until then to start attracting birds.